Roger Grimsby was born on September 23, 1928, in Missoula, Montana. As an infant, he was adopted by the Grimsbys. Rev. Oscar M. Grimsby was a Lutheran minister in Missoula. He and his wife, Ragna E. Grimsby, both grew up in Wisconsin and both were graduates of Minnesota’s St. Olaf College, which was where they met as students. Roger planned to enter the ministry. Following an illness in Korea, however, the army gave him a radio newscasting job in Tokyo, from where he broadcast news, music, and weather to the front. Returning home, Roger began a series of news jobs at WEBC Radio in Duluth; WEAU-TV in Eau Claire, Wisconsin; WISC-TV in Madison, Wisconsin; WXIX-TV in Milwaukee, Wisconsin; and KMOX-TV in St. Louis, Missouri. In 1959, he won a Columbia Broadcasting System Foundation Fellowship for a year’s study at Columbia University in New York. In 1968, he was working at KGO-TV in San Francisco, California, and was offered a job as anchor at WABC-TV in New York City, which he accepted. 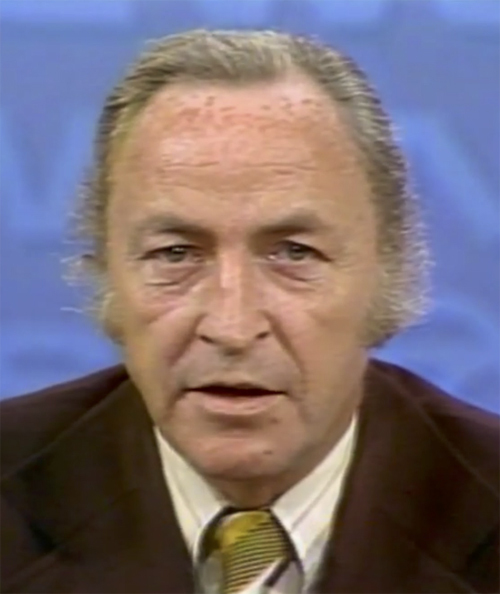 Roger won six local Emmy Awards for his work at WABC-TV, and at the end of his time there he was reportedly earning $1 million a year. He is credited with originating the “chatty” style of delivering the local news that was imitated around the country. Roger also appeared in several movies and television series, playing either himself or a newscaster. His movie appearances include Woody Allen’s Bananas (1971), Exterminator (1980), and Ghost Busters (1984); TV series appearances include Ryan’s Hope, Equalizer, and Eyewitness News. Rev. Grimsby stayed on as pastor of Zion Lutheran Church until his retirement in 1962. The couple remained in Duluth, and he was living in the Aftenro Home on Nineteenth Avenue East when he died on April 6, 1980. Ragna died on October 30, 1989. Roger died of lung cancer on June 23, 1995, in New York City.